'What's new? page at John Grenham's Irish Ancestors site. The United States Citizenship and Immigration Service (USCIS) announced today, October 2, that beginning October 1 through January 2, 2018, it will transition the processing of USCIS genealogy requests from Washington DC to the USCIS National Records Center in Lee's Summit, Missouri. 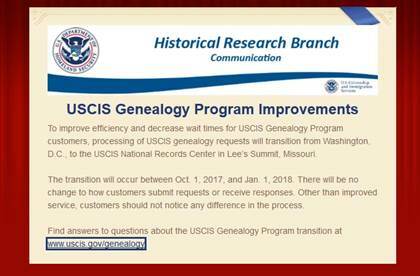 The reason give is to improve efficiency and decrease wait time for USCIS Genealogy Program customers. There will be no change in process of requesting or receiving responses. The USCIS Genealogy Program is a fee-based service. 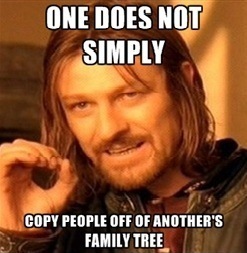 To learn more about the service, its fees and how to request records see: https://www.uscis.gov/genealogy. The (US) Library of Congress launched the Federal Courts Web Archive. It provides archival coverage of the websites of the federal judiciary which includes: U.S. Supreme Court, federal appellate courts, trial courts, U.S. District Courts, U.S. Bankruptcy Court, U.S. Court of Appeals for Veterans Claims, U.S. Court of Appeals for the Armed Forces and other tribunals. Many of these courts could hold information of interest to genealogists. Information found on the website includes: transcripts, announcements, judicial biographies, dockets, slip opinions. It appears as if the initial date for archiving materials was 2000, with many starting in 2002. The IAJGS Records Access Alert reported on September 17 about the proposal from the New York City Department of Health and Mental Hygiene proposal on restricting access to birth and death records by imposing a 125 year embargo on birth records and 75 year embargo for death records once they are transferred to the NYC Department of Records and Information Services (DORIS). The Municipal Archives is within DORIS. This is similar to the 2011 Model Vital Records Act which imposes a 125 year embargo on birth records, 75 years for death, and 100 years for marriage records. A hearing is scheduled for October 24, 2017 and written comments are invited and must be received by October 24, 2017 5:00PM ET. With about 50% of all immigrants to the US entering through Ellis Island in New York City almost everyone, regardless of ethnicity, has an ancestral tie to New York City and should be concerned about this proposal. If this passes we will undoubtedly see this type of restricted access proposal spread across the United States. Please visit the landing page and see draft suggested letters and sign the petition. If you are part of a genealogical society please share this information with your members. IAJGS will be sending its own letter of opposition to the NYC Board of Health. Marriage records are not covered by the NYC Department of Health but by the City Clerk's Office and therefore marriage records are not affected by the proposed regulation. Win an adventure weekend away for six! Getting Creative in County Westmeath! Was your family shanty or lace curtain Irish? It’s important. Getting Creative in County Wicklow!